179 people in 39 groups had registered for the competitions. Among the participating groups, 13 were from other provinces. 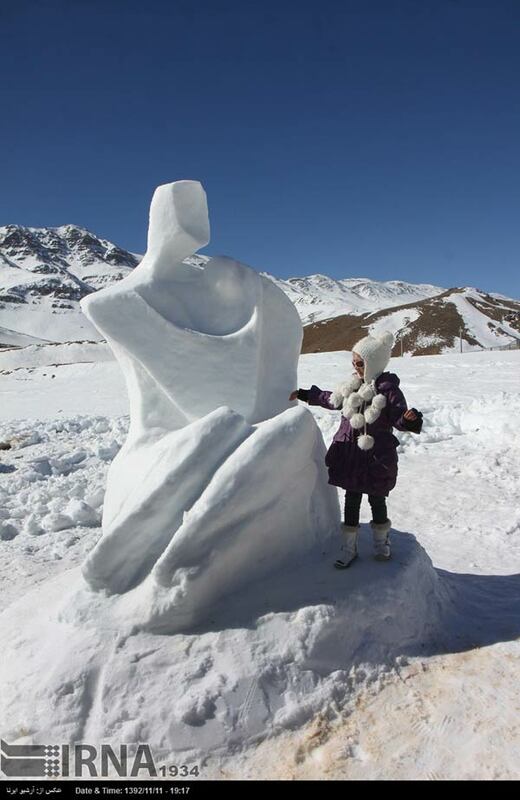 These groups created many giant snow sculptures which decorated the landscape and captivated the visiting people. Boroujen is well known by its extremely cold weather, usually mentioned as one of the coldest Iran cities in national weather forecasts. It is located on an altitude of about 2197 meters from sea levels. Its climate is usually combined of moderate summer climates as well as very cold winters. Snow days are normally 122 days per year, and the temperature could reach -27°C. The maximum observed temperature has been 36°C. Average annular precipitation is 243 mm (24% in the spring, 1% in the summer, 33% in the fall, and 44% in the winter). This entry was posted in Culture, environment & climate and tagged Photos on February 3, 2014 by socialinform.